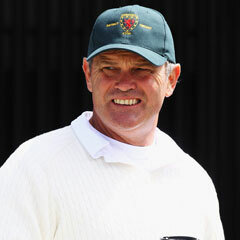 Melbourne - Terminally ill Martin Crowe admits that Sunday's Cricket World Cup final between his beloved New Zealand and Australia could be the last game he'll ever see. Known as one of the game's most stylish batsmen, the 52-year-old Crowe has been battling a rare blood disease, double-hit lymphoma. "My precarious life ahead may not afford me the luxury of many more games to watch and enjoy. So this is likely to be it. The last, maybe, and I can happily live with that," wrote Crowe in his column on www.espncricinfo.com. Crowe will be at Sunday's game at the Melbourne Cricket Ground hoping to see Brendon McCullum's New Zealand win a first World Cup title after previously falling at the semi-final hurdle on six occasions. "I will, like so many Kiwis making the short trek across the Tasman, feel this, as McCullum has stated clearly, to be the greatest cricketing time of our lives. Four million dare to believe, while 11 (and back up) dare to achieve." Crowe played in 77 Tests, averaged 45.36 and scored 16 centuries which still stands as a New Zealand record. His highest score of 299 at the Basin Reserve in Wellington against Sri Lanka in 1991 stood as a New Zealand best until McCullum scored 302 against India on the same ground last year. McCullum said he had read Crowe's article and revealed how the former captain, whose team lost to Pakistan in the 1992 World Cup semi-finals in Auckland, had been involved in preparing the current squad for the tournament. "We had him involved in the group, and not long ago he came and spent time with the team and it was great," the captain said. "He has been instrumental in helping some of our guys on the team peel back their games and really focus on being able to develop individually but also buy into the team collectively. "He's been a really big asset. I think what he's going through at the moment is incredibly difficult. We just hope that he's able to find some peace in the time that he's got left."